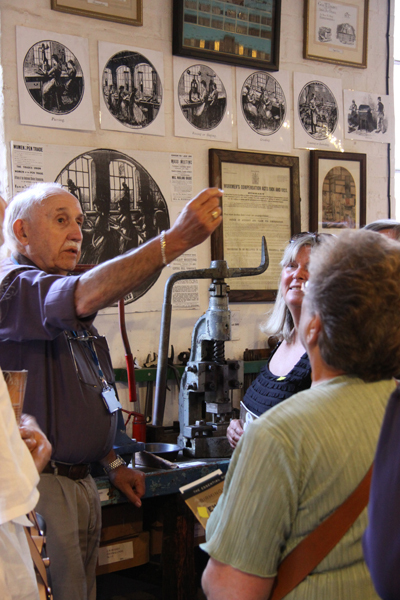 The Jewellery Quarter’s very own bespoke tour operator ‘Alternative Tours’ hosted a visit from the ‘Merry Wives of Alcester’ (MWA) group. 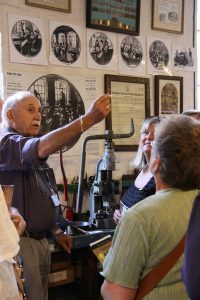 This was a specially tailored and carefully planned evening event which started at the Pen Room, with Andy Munro giving an illustrated talk about the ‘Jewellery Quarter, Past and Present’, liberally laced with some humorous anecdotes… described by the MWA as ‘an extremely interesting talk’. 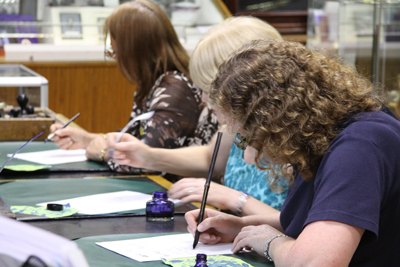 The 40 strong party then enjoyed a tour of the Pen Museum which included activities from writing with a quill pen to making their own pen nib – the ladies were particularly entranced by Larry Hanks’ virtuoso performance in giving some stern instructions on the process of making the nibs. With conducted stops along the Quarter’s unique pavement trail, the party made its way to Artful Expression where tour organiser, Anna Gibson, had arranged for designer makers to be on hand to explain how they both designed and made such unique jewellery. Described by the party as “fascinating” this proved a compelling insight for all concerned. The evening ended with a convivial meal at Portofino with Eric Oglu, as usual, in top form to ensure a fitting end to an enjoyable evening. ‘Everyone loved the food’ was the after meal comment by the organiser of the trip. ‘Trip Adviser’ eat your heart out! 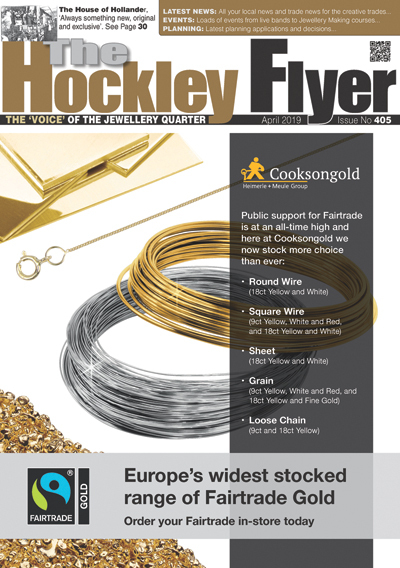 However more importantly for the Jewellery Quarter, the four hour visit was just a taster and many of the party have said that they will return to both shop for jewellery and visit the Pen Room.